Our client knew almost exactly what they wanted and were looking for a contractor who “got it” and who could execute that vision. 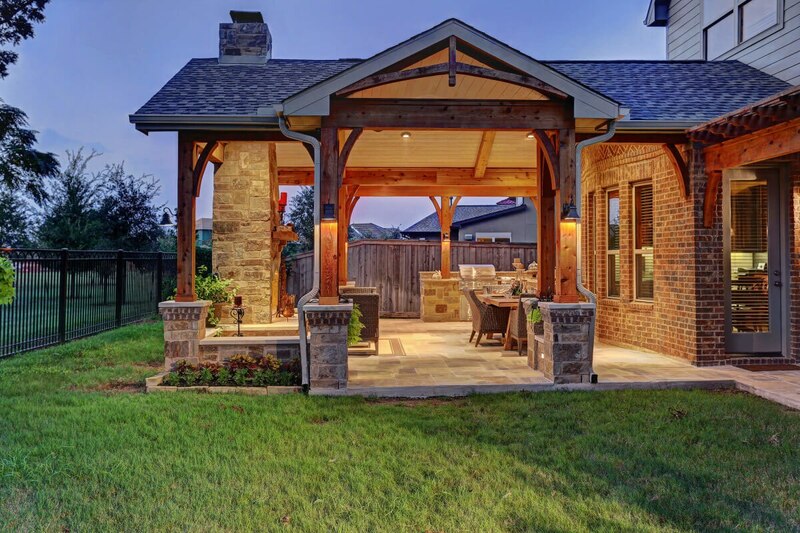 We started with a blank slate…a typical “outdoor living space” provided by the home builder. Our Project Developer designed a project that included generous space for dining, grilling and sitting by the fire. The ceiling is a tongue & groove pine that has been white-washed to contrast with the darker cedar beams. The key to the project was the finishes, such as gently curved corbels and rack bracing to match the beams and columns finished in cedar. The wood-burning fireplace was designed with a unique tapered look. Gable features create a dramatic entrance on one side and a vaulted ceiling for the soaring fireplace. A stone seat wall surrounds the entire project with cast stone caps and low-voltage lighting. The floor is a stone tile which the homeowner selected to complement the stone on the fireplace, kitchen and kneewall. Finally, the outdoor kitchen has bountiful counter space for food prep and service.